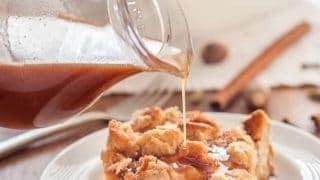 Gluten-Free Chai French Toast Casserole is easily made ahead and baked just before you are ready to enjoy it. The honey-butter sauce drizzled on top adds the perfect touch of sweetness. This post is sponsored by Canyon Bakehouse. As always, all opinions are entirely my own. I genuinely love Canyon Bakehouse, which is one reason I love working with them. Thank you for supporting Flippin’ Delicious and the companies and I work with. Chai is one of my favorite winter flavors. Something about the complex spices with just a hint of sweetness keeps me going back for another sip. 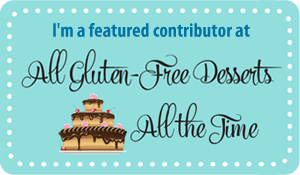 Chrystal, one of my best gluten-free blogging friends also loves chai and has created some really tantalizing gluten-free chai recipes, like her gluten-free chai coffee cake. 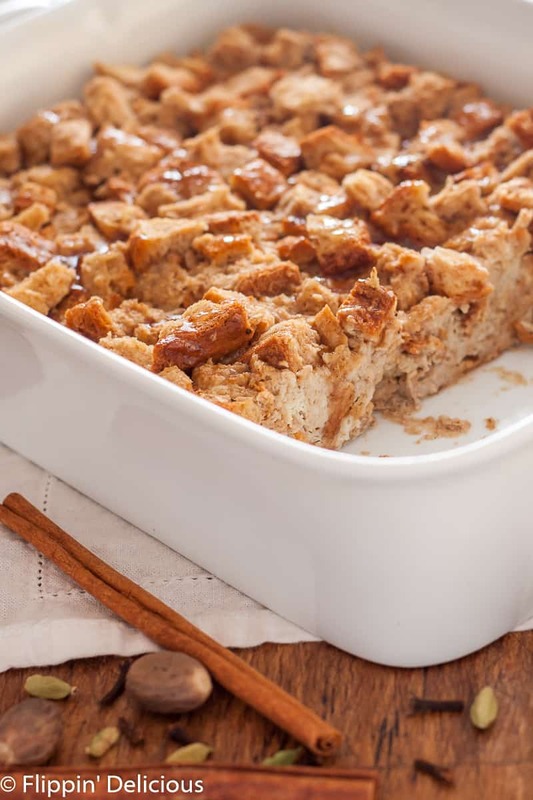 Since my love of chai rivals hers, I wanted to put a chai-spice spin on my family’s favorite french toast casserole. The chai is subtle enough that it wasn’t too spicy for my kids (which is a must for me, I’m not making two separate dishes for breakfast, I don’t have time for that!) However, the festive and fragrant spices really shine through and made our brunch feel festive. The top of the bread was a beautiful golden brown, and the center of each slice was slightly sweet and custardy. The drizzle of honey butter on the top adds the perfect touch of sweetness, my kids loved it! I love Canyon Bakehouse’s Heritage Loaves (can I get a 🙌 for regular-sized sliced bread!) We almost always have a loaf in our pantry or in our freezer. I used their Honey White Heritage-Style Loaf in this recipe, but if you can’t find it near you their Mountain White bread would also work great! Back before my family was gluten-free, we would make stuffed french toast during the holidays – prepping it the night before and tossing it into the oven to bake while we opened presents on Christmas morning. A few years later we switched to a cinnamon-roll inspired french toast casserole. The prep is so much easier making a french toast casserole, and it was a hit with the whole family. 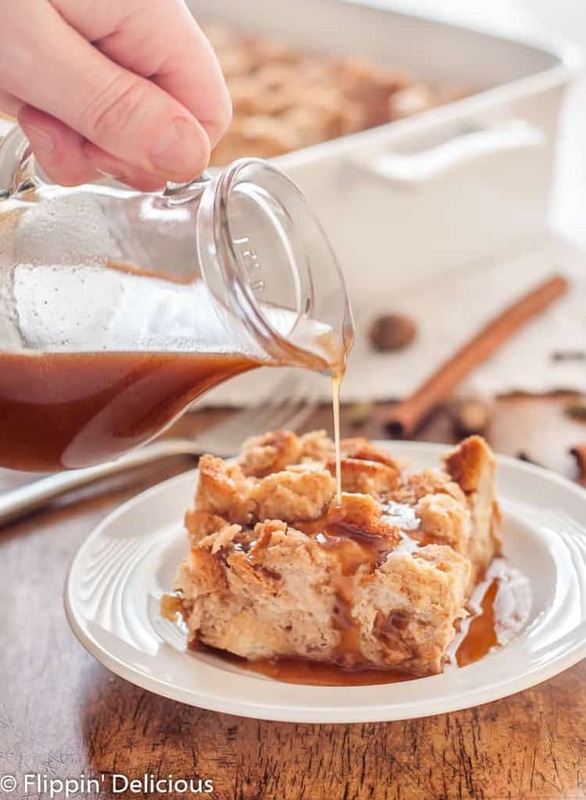 Over the years I’ve made several different french toast casserole recipes, including a gluten-free eggnog bread pudding with is one of my favorites! (The bourbon caramel sauce puts it over the top!) I think that this newest french toast casserole is stiff competition for all of our previous favorites! The texture is perfect and the flavor is festive while still being appropriate year-round. I have such fun memories of holiday brunch or breakfast, and want to give my kids similar happy memories. My family always made a big brunch on Christmas morning, and noshed on it all day. We always had some version of a french toast casserole, along with a gluten-free raspberry cream cheese coffee cake, some gluten-free pumpkin chocolate chip muffins, and usually a hash brown casserole. We always looked forward to brunch with great anticipation. 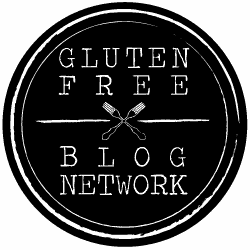 If you are looking for more dishes for your brunch recipes, I planned and styled a complete gluten-free holiday brunch last year. 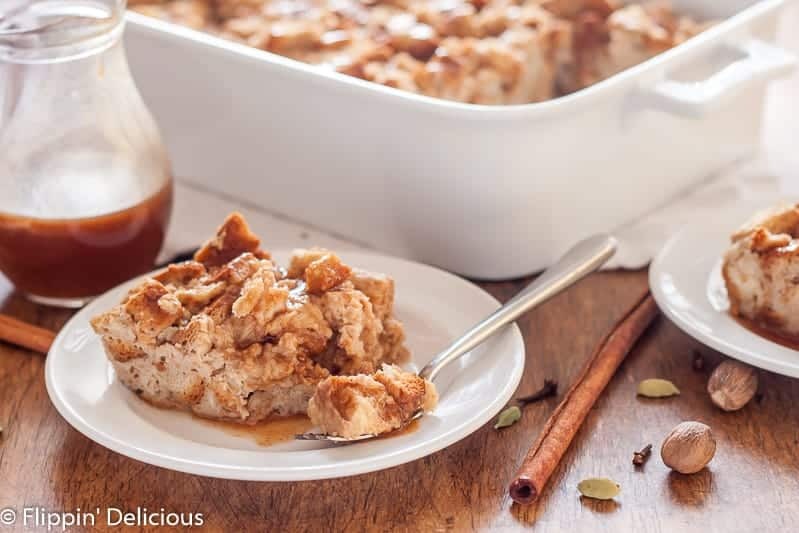 Grab a few dishes to add to your gluten-free chai french toast casserole to complete you festive spread. Place the milk in a microwave safe bowl. Heat in 30-second increments until steaming. Add the tea bags and steep for approximately 5 minutes. Remove the tea bags and whisk in the spices, sugar, and vanilla. Add the eggs and whisk until fully incorporated. Add the cubed Canyon Bakehouse Honey White Bread, and mix with a spatula until it is all evenly coated. Lightly grease a casserole dish with cooking spray. Pour the filling into the casserole dish and spread evenly. Tightly cover with aluminum foil. Preheat the oven to 350F. Bake until just set, between 40-50 minutes, maybe longer depending on how deep you casserole dish is. Remove the foil the last 10 minutes of baking. Refrigerate until you are ready to bake. Place the casserole in a cold oven, then turn the oven to 350F. Let bake until just set. Depending on how long it takes your oven to heat up, it can take anywhere from 45-60+ minutes. Remove the foil the last 10 minutes of baking. Soften the butter, and whisk with honey, vanilla and cinnamon until smooth. Drizzle over the baked french toast casserole. I used almost a full loaf of Canyon Bakehouse's Honey White Heritage Bread. If you can't find it, try using Canyon's Mountain White loaf. I think you'll need about 1 1/2 loaves. Once cubed, I had about 10 cups of bread. Could you use this bread for a strata recipe as well? My hubby is GF and this is our first time heading through the holidays with that. 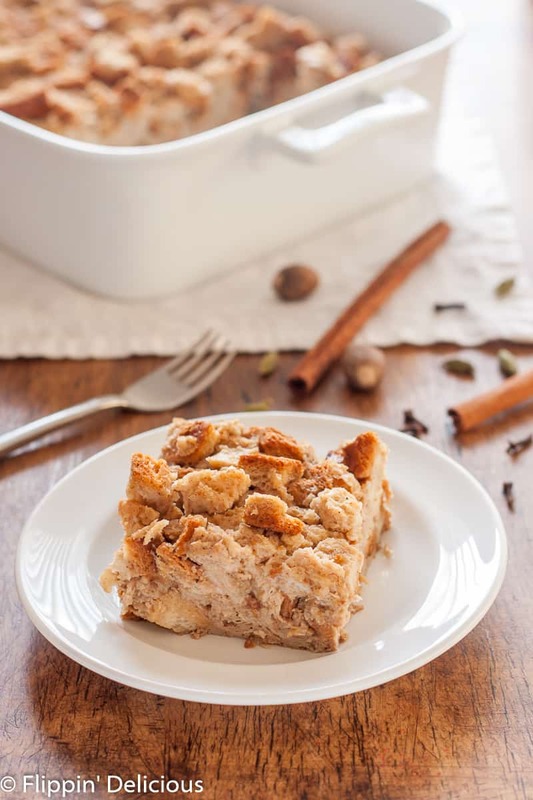 We usually have a strata for breakfast, similar to how you described this chai french toast casserole (which sounds AMAZING). You absolutely could! Canyon is our go-to. You may want to try their Rosemary Thyme Focaccia, I’ve heard it makes a really great strata too. What size of dish do you use?